BB-8 is around the Bihar region, but weaker at 1002 mb. Precipitating rainfall in the region and keeping the monsoon active there. Kolkata continues to receive good rains. Rains already pushing into Nepal (central) region. Important to keep an eye on "Haitang" (996 mb) and "Nisat" (880 hpa). Getting Hotter, Getting Colder ! Hottest in the sub-continent was Dalbandin and Sibbi (Pakistan) at 38c, though Karachi is still ok at 32c. In India it was 37c at Machilipatnam. AlAhsa (Saudi Arabia) was hottest in Asia at 44c, while Sharjah is still hot at 43c. Lowest In India for Sunday was -3c at Darbuk (Ladakh), while Leh minimum was at 5.8c. Gulmarg was 5c Sunday morning. Putting up this OLR map to make it easier to chalk out SWM withdrawal region.The Brown and Yellow regions could be construed (criterea for today,and not as a rule) as Monsoon free. The OLR is getting un-favourable, the upper air humidity is decreasing and the jet stream re-organising itself with the changing season.The SWM retreat line is likely to cover Gujarat and more of M.P, Kashmir and H.P. in the next 2 days. The withdrawal is fast approaching Maharashtra, and as a last minute haste, thunder clouds and showers were experianced in the interiors on Saturday and Sunday, though scanty and heavy in a few pockets only. Observed some thunder cells on Sunday in the NW and East on Sunday. But approach over the city was avoided, as was the case in Panvel (Junaid's report). But Matheran received 5 cms.and Bhivand (extreme east of Mumbai) measured 5 mms. Thunder cells are a natural occurance at this time (as explained in Mumbai note). They form as the SWM retreats, and convection occurs. The sea breeze continues till interuppted by a thunder squall. The cb clouds are not yet "dominating", and are not able to form the local downwards squally gusty winds usually associated with a rain bearing powerfull cell. Monday/Tuesday: Temperature range: 32c - 25c. Cloudy morning, with light precipitation in scattered parts of the city. A short spell of clear mid-day, with thunder cells developing. By afternoon, thunder clouds could come over from the east, and precipitate in some areas. Could be accompanied by a squall. Seeing the current SWM withdrawal progress, I would stick to the earlier given date for Mumbai: Withdrawal by September end. Pune Forecast for Monday/Tuesday: Temperature range: 30c - 20c. Cloudy day, with thundershowers towards afternoon evening. when is monsoon withdrawing totally from mumbaiiiii..??? sridhar:As mentioned, should be out by end september. How about Haitang and Nesat, esp Haitang which is predicted to track through central Vietnam, Central Laos, Northern Thailand and then Southern Myanmar.. From then on, could the "pulse" from the system recharge the BoB ? 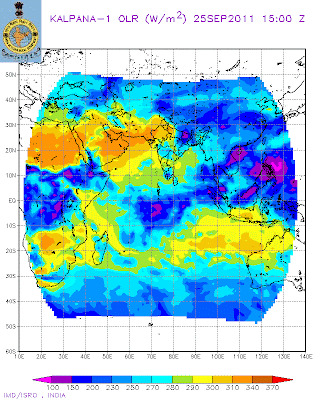 @rajesh see this upper tropo - humidity map !! Wuld it be true that Delhi is drier than Saudi Arabia ? thundershowers does not seem to be anywhere close in the next one week..????? I would like to comment on two topics: First, the more immediate weather. The last 24 hrs. Lightning map does not show any Lightning activity at all in the entire Maharashtra area, the skies yesterday in the Western Suburbs were nearly clear and I personally did not see any CB clouds on the Eastern Horizon, also it was breezy and on the pleasant side of things here at Juhu towards the evening and night. One would generally expect a 'stuffy' weather preceeding a Thunderstorm. The second topic is on the article that appeared in the print edition of TOI couple of days back citing the lack of experts in India. They especially pointed out Metereology (amongst other areas that were discussed) and the lack of weather experts in India. Just wanted to reinforce the need for a forum which can bring experts like Rajeshbhai and other Blog writers in India together. Rajeshbhai, I am aware that we need to meet and think through this, I just thought about you while reading that article. sky,,,,,today no such development is observed !!!! But today an increase in humidity can be felt unlike yesterday wen the relative humidity was only 42%at 1730 hrs at panvel!! !sadly it rained in matheran but panvel hasnt received any rain since 21st sept!!! (wen it precipitated due to strato cumulus formation)@rajesh ...the weather seems to be typical of early october ....has the anticyclone arrived at our doorstep??? 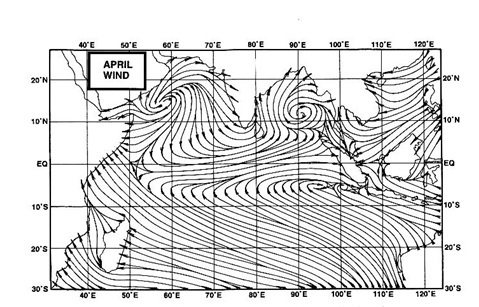 and can u clarify we are in wich phase of MJO??? ?